BEHOLD – mediocre, frozen Chinese food. Given to man by the lamest Prometheus. Most of the time Trader Joe’s manages to make their frozen food look quite delectable on the bag. For some reason, they just couldn’t manage it with their chicken chow mein. From the barren, spike-filled background on which it sits, to the uninspired “here it is” presentation of the dish, the whole picture wouldn’t look out of place inelegantly thumb tacked to the wall of that Chinese food place you never go in. That should always be your first tip off. If the small army of marketers behind the promo picture, armed with the latest in unscrupulous food trickery and photoshop, can’t make it look good, it’s probably not very good. From the get go you know it’s not going to be pretty, so the question really is, What do you expect from a frozen chicken chow mein? There’s plenty of good, fresh cooked chow mein out there, but this chicken chow mein isn’t that, and it never will be. This is simply a bag of frozen noodles and vegetables that you can cook up in about 7 minutes. While there’s nothing amazing or exemplary about this chow mein, there’s nothing bad about it either. It’s there, you’re not going to do any flips over it, but it’ll get the job done – which in this case is nourishing your meaty bod. There are no special tricks here, it looks like a pound of frozen chicken, vegetables and noodles and that’s what you get. The frozen broccoli, julienned carrots, onions, and strips of red pepper taste just like reheated frozen vegetables always taste – somewhat limp, somewhat muted. The same applies to the chicken, which is entirely ordinary cubes of white chicken breast touched up with some salt. All told they are entirely edible and perfectly acceptable for a no frill Tuesday night, but not something that is going to light up your evening. The noodles are a cut above what you’d expect to get from a cup of ramen, but not by too much. Like the rest of the meal, they are just good enough to pass mustard without excelling. 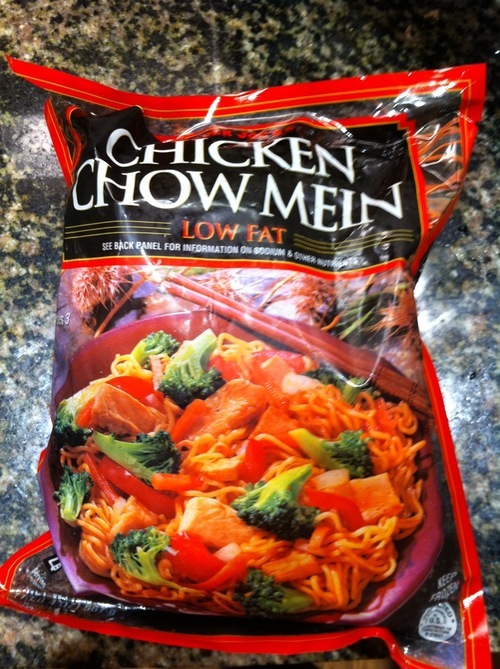 A frozen chicken chow mein is meant to be a quick and easy meal, and that’s what Trader Joe’s delivers. Unlike some of their other, higher quality dishes like Trader Joe’s Kung Pao Chicken none of the ingredients are separated out for individual cooking. This is a bag you rip open and dump in the pan. As far as that goes, it’s good, but it never aspires to anything above that station. And that’s precisely the problem. Trader Joe’s has a lot of excellent frozen dinners to offer, even in the “lonely bachelor food” category. Along with the aforementioned Kungo Pao Chicken, there’s Thai Sai Tung Curry, Hake en papillote or Pizza Veggie Burgers. The list goes on really. If you’re really hurting for chow mein, make your own or just order in. Otherwise, there are plenty of other options out there for your last minute dinner needs. Would I Recommend It: Apathetically, perhaps. Would I Buy It Again: No, I think I’ll stay a Kung Pao man. Final Synopsis: It’s good for a frozen chow mein, so in other words, “meh”. I have never tried this product, but I agree, love me some kung pao chicken! Thanks for your wonderful website, I am such a fan! Literally so disgusting. I bought this and made it and its was WAY too sweet and just plain disgusting. I do not recommend this. Ew. I was do disappointed I picked this up and found a bone in the mix. I thought this was delicious! Easy to make and tastes just as good heated up. It’s “pass muster” you dumbass. A terrible product in every way-mushy, way to salty, nothing good about it. Save your money. Just tried this chow mein for the first time and really enjoyed it! The sauce is sweet, tangy and a bit salty but has a nice mix of the three. 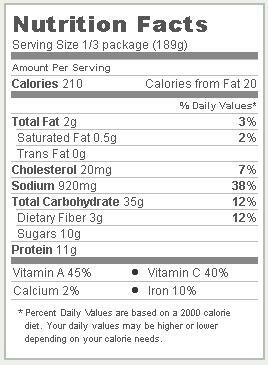 I added some extra chicken strips in it to bulk up the protein a bit. The briccoli held their form well even microwaved, they were a bit crunchy which I like. The noodles warmed up well but yes are the same kind of noodles as ramen, which is what typically restaurants use to make chow mein. But Personally I think this review is a bit harsh. This is a frozen dinner, not fresh take out and I wouldnt expect it to taste exactly like it microwaved. But if you take the time to defrost the package, drain the extra water & then cook/fry the ingredients over the stove with your favorite oil, it is delicious and a great price with some nutrition for a meal that can feed a small family for under $10! So with all that in mind I’d take the frozen chow mein over a heavy carb, low nutritional meal like pizza any day! Thank you TJ’s!